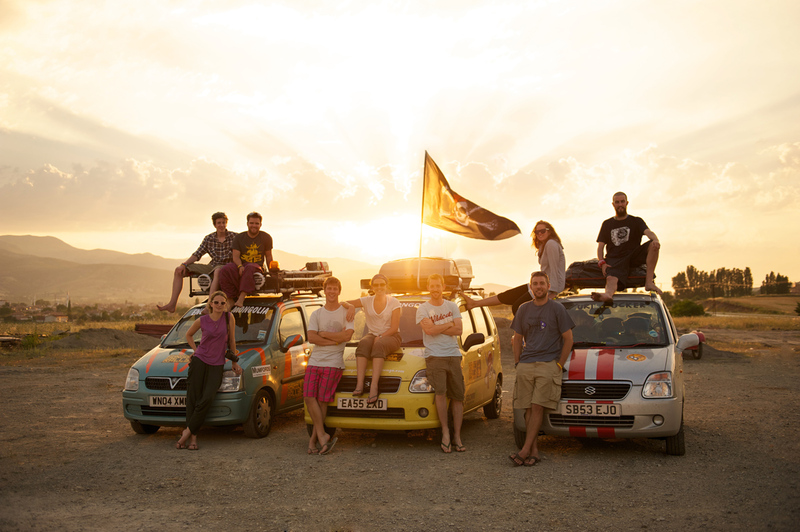 43 days, 19 countries and 9058 miles from the UK to Mongolia. 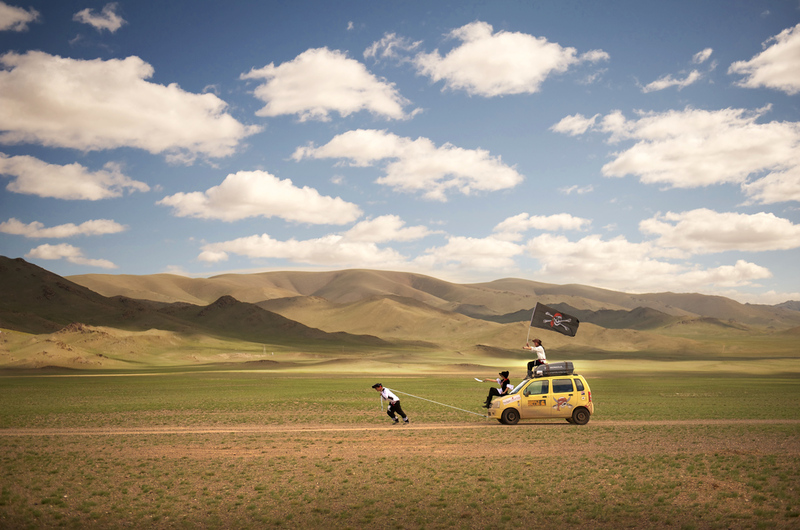 The Mongol Rally lived up to every expectation I had of it. Adrenaline, incredible scenery, some of the friendliest people I have ever met, bad stomachs, worse roads, blazing hot days, freezing cold nights, the clearest starry skies I have ever seen. I could spend all day describing this trip, but as they say, a picture is worth a thousand words so here are some of mine. The whole event kicked off at Goodwood Race Track. 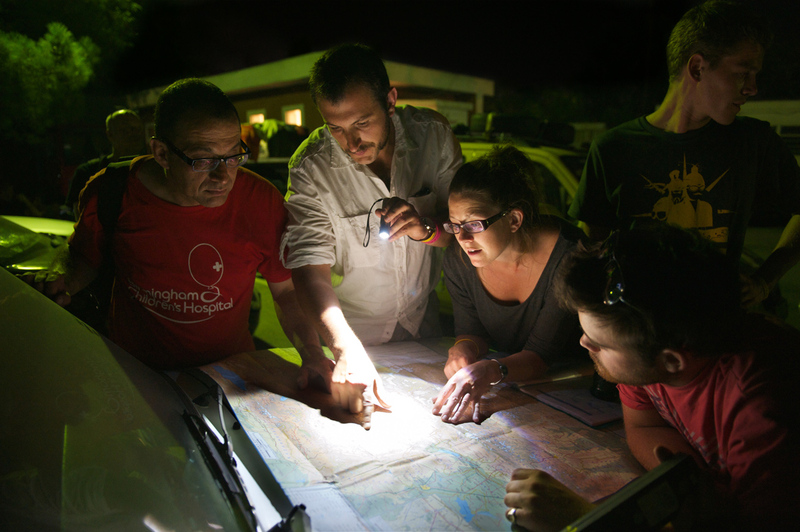 After a night fuelled with a few drinks and a lot of rain, we packed up our soggy equipment and joined the leaving party. I have to confess that after being so tired, soaked and hungover, we wussed out and stayed in a hotel in Dover on the first night. 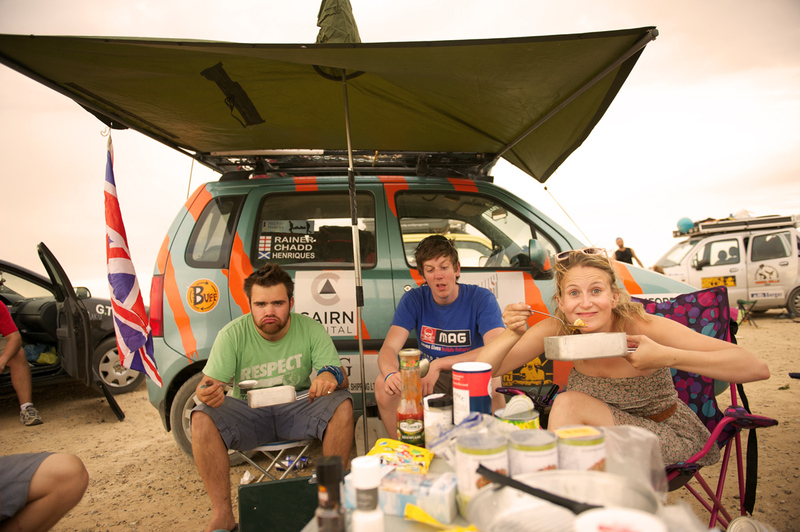 Europe consisted of long days driving, hard nights partying and not so many photos. 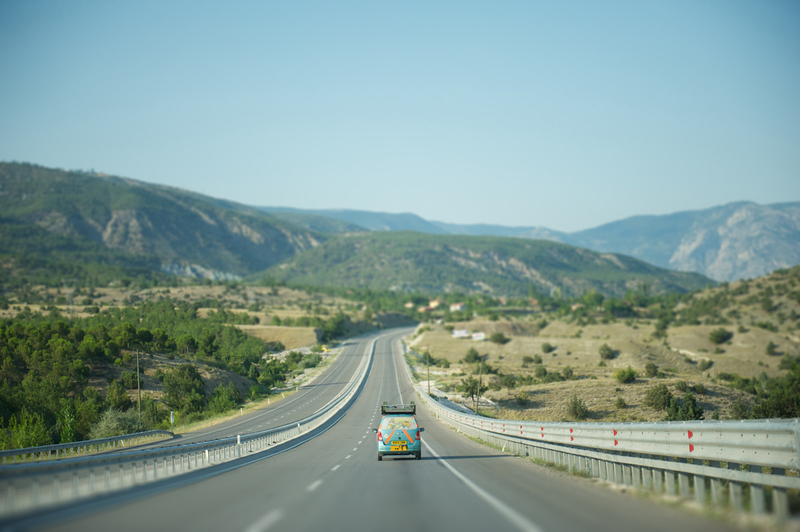 Heading into Turkey we joined a convoy of two other Suzuki Wagons (The Mongateers and the Yurt Locker). 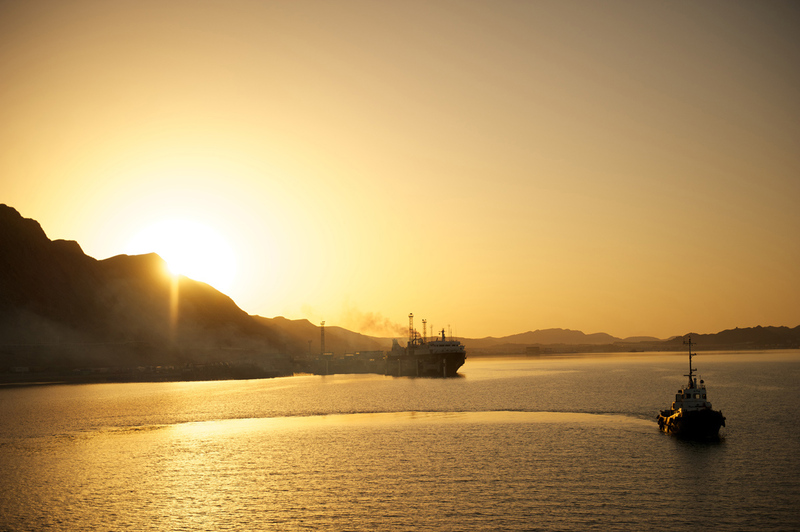 Below is a photo taken against a backdrop of a beautiful sunset in Eastern Turkey. It was great fun driving with these guys, it felt like being in a scene from the Italian Job. 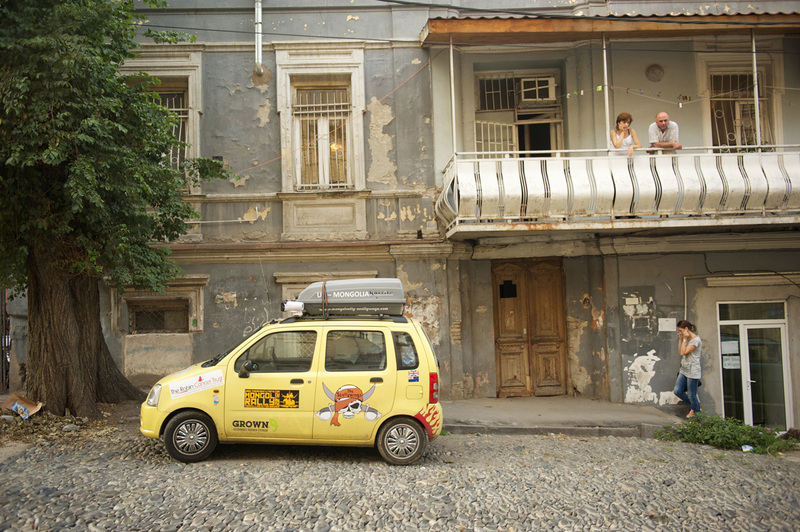 Arriving in Tbilisi, Georgia, the locals were so friendly and took a real interest in the car and our route. 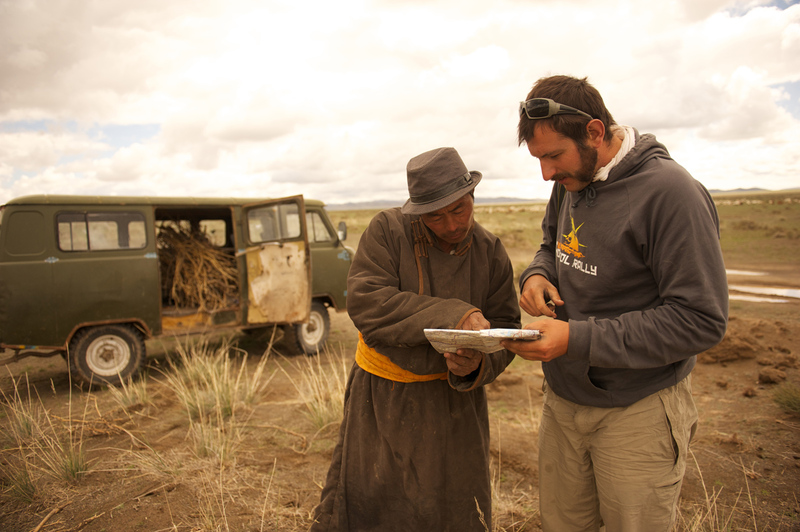 Studying a map to work out the best route through Central Asia. We were stuck at this port in Baku, Azerbaijan for around 19 hours before the cargo ferry finally left. 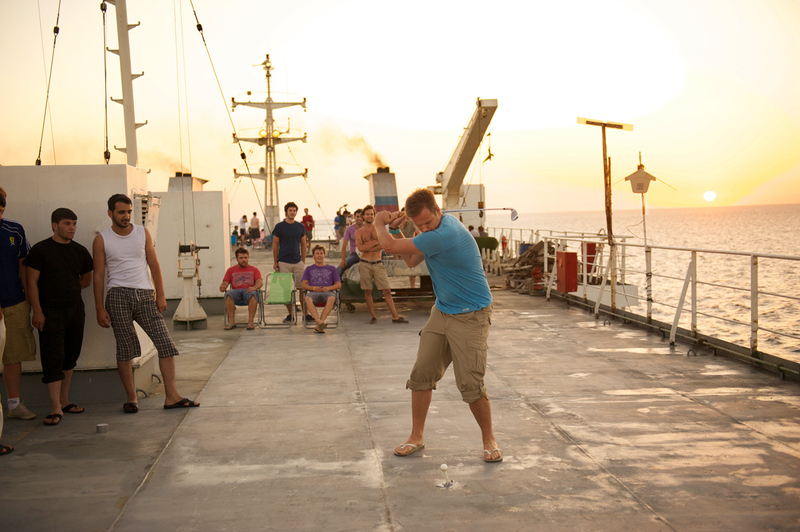 The ferry took around 20 hours and was an experience I won’t forget. There was one toilet available for around 100 people, it was full to the top with faeces and everyone was using the one available shower to do their business. 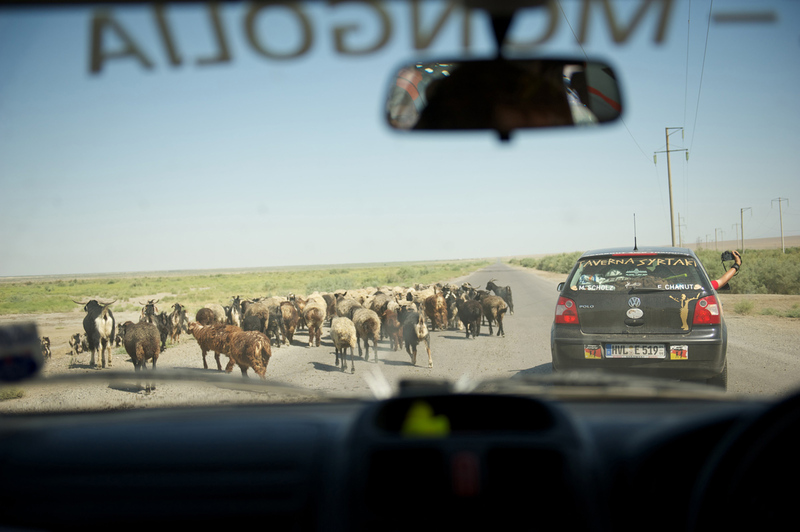 When we eventually arrived in Turkmenistan it took over 12 hours to get through the bureaucracy of importing a car. We found things to keep us amused during our time on the ferry. Some local engineering students watched us hit golf balls from the deck. 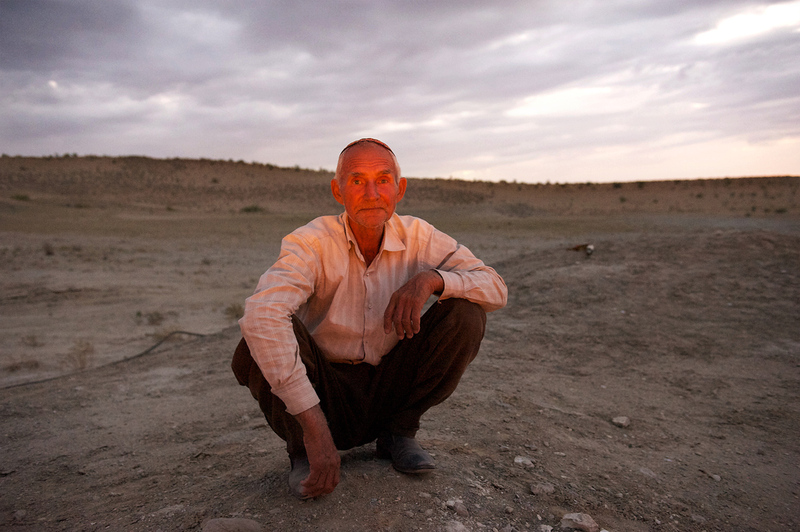 Turkmenistan was a strange but beautiful country. 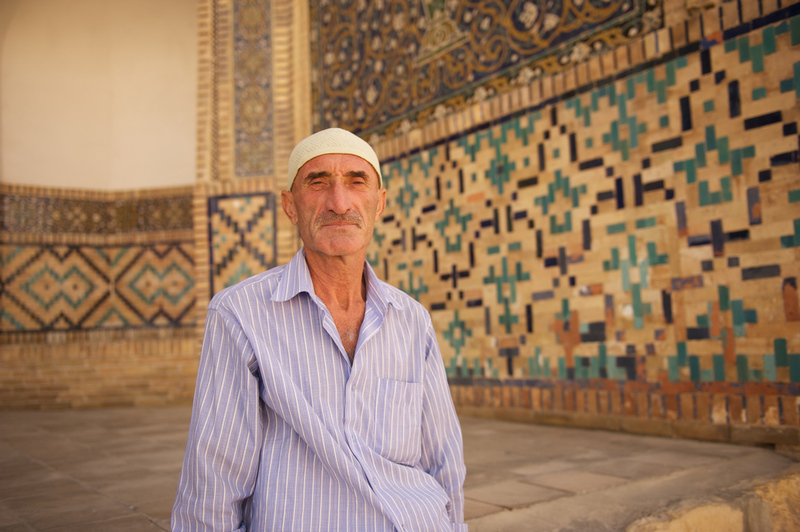 Despite being ruled by a despot who makes decisions like demolishing whole towns because he doesn’t like them, the people were still incredibly friendly. The capital Ashgabat is a white marbled but almost ghost like city. 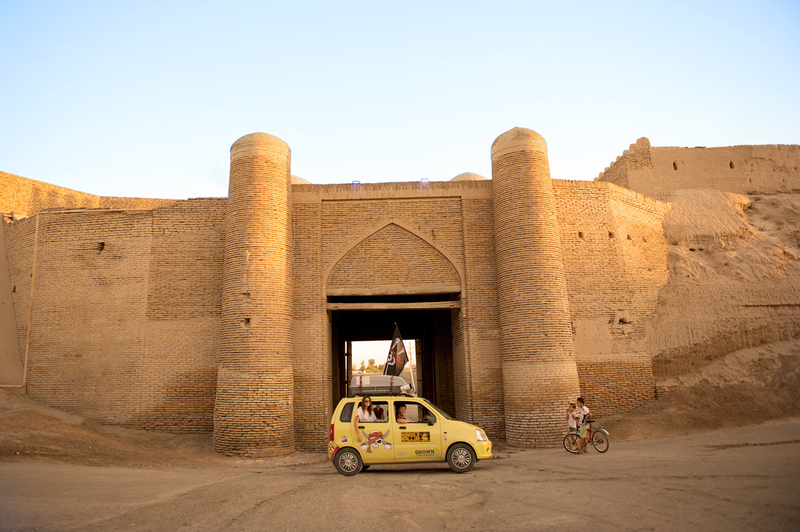 We were banned by the many Police in the city from taking photos of any worthwhile buildings and we decided to quickly head on through the desert to Darvaza. Below is a local we found whilst looking for a 4×4 to take us through the dunes to the Darvaza Gas Crater (a huge burning pit known as ‘The Gates to Hell’ locally. 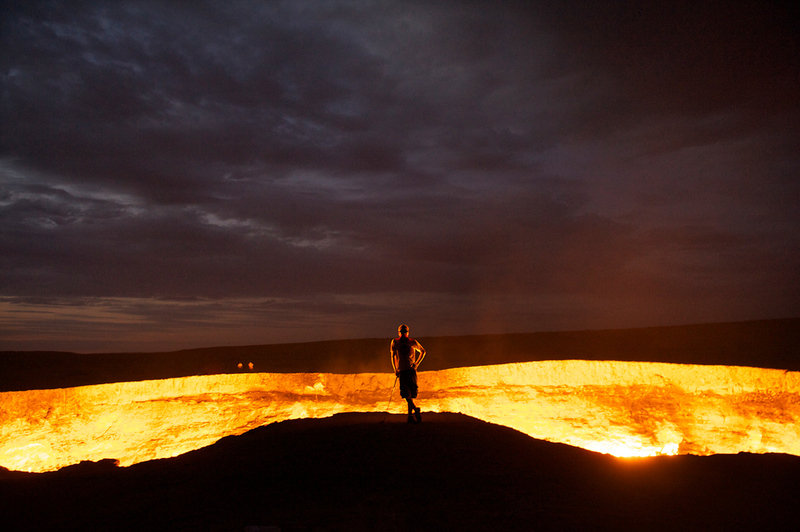 It was a gas pipeline that was purposely exploded over 30 years ago and is still burning ferociously to this day). 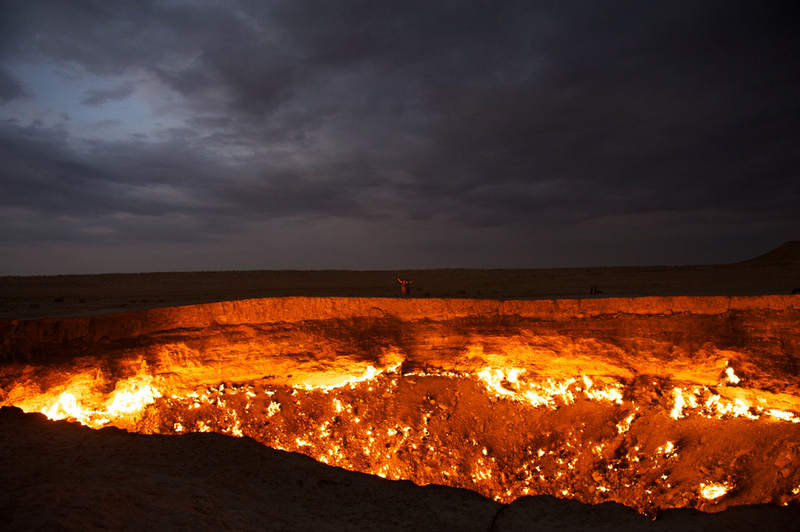 Our first site of the Gas Crater did not disappoint. Belinda and James catching some rare alone time together over the other side of the crater. Jerome posing with his gold club after teeing off over the crater (somehow he managed to hit the only person on the other side of the crater full in the face with the golf ball. Even more impressive was that the local man wasn’t hurt at all). Our driver across to the Crater resting and waiting for us, the orange glow from the fire below just catching his face. Moments before this he had had an argument with another local over who was taking us and tried to attack him with a 12 inch spanner (ralliers stepped in and saved the day). 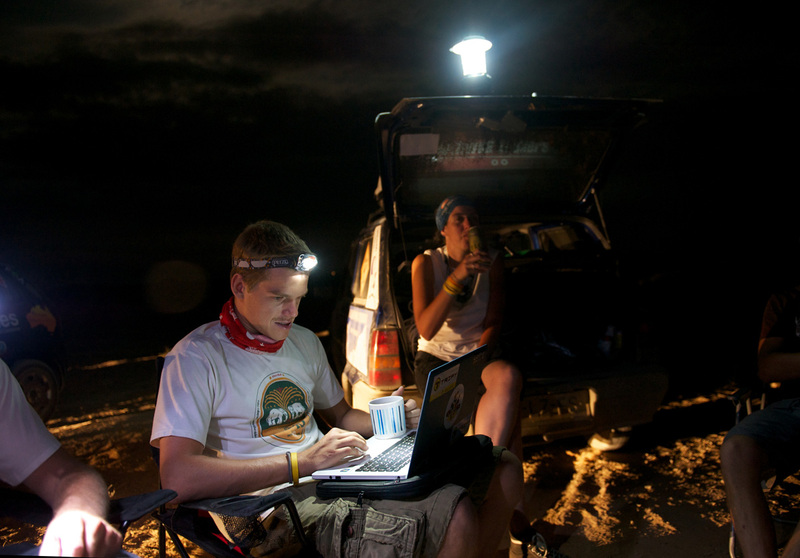 Jerome editing some photos just after our return from the gas crater. I really enjoyed camping in big groups. There was always a hive of activity going on, people cooking, drinking, playing on laptops. 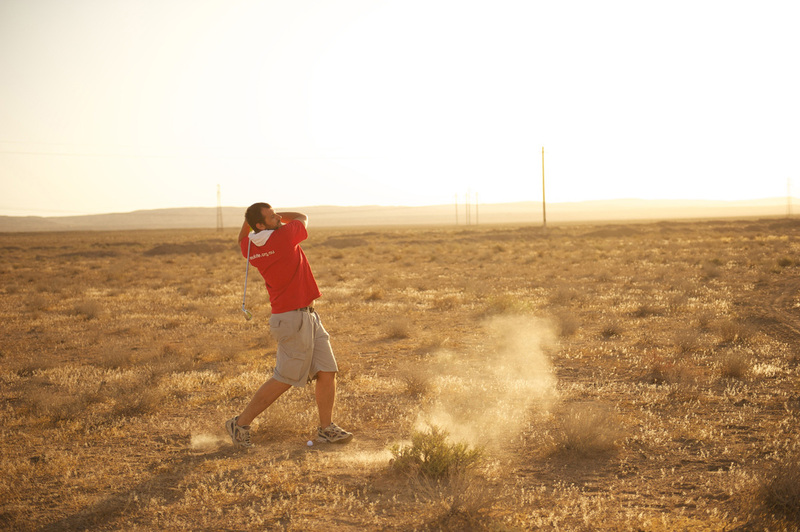 More golf in the desert the morning after our campsite in Darvaza. The first herd of livestock seemed like a novelty. But after 6 weeks of having to slam the breaks on for goats, sheep, cattle, camels, yaks and even a wolf crossing roads it did begin to get tedious. The Mongateers enjoying their dinner…. I think. 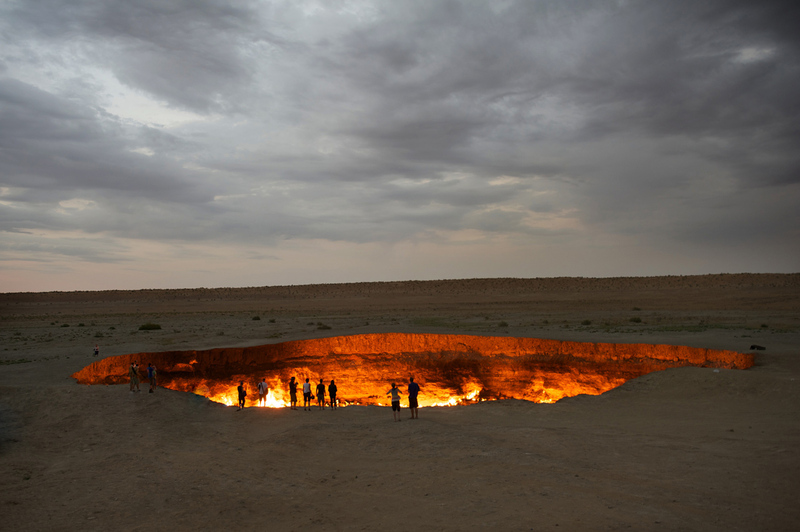 Things began to get really dusty from Turkmenistan onwards. Everything in the car was covered in a layer of dust and grime, there was no escaping it. The buffs given to us by the adventurists really came in handy here as the taste of dust permanently in your mouth is not a pleasant one. The temperature also reached 50 degrees centigrade here according to our car. I think this may have been exaggerated but it certainly reached the late 40s. Opening the window in the car the air felt as hot as a hair dryer. 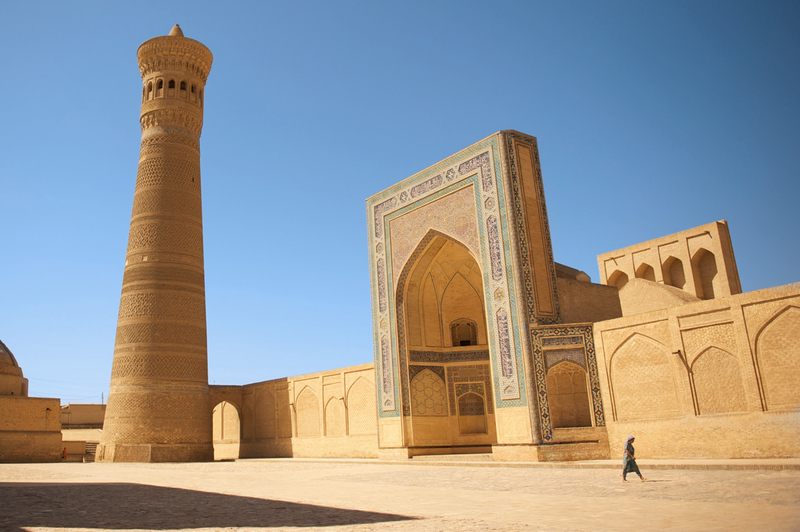 From Turkmenistan we headed north in Uzbekistan and travelled through the silk road cities of Khiva, Bukhara and Sumarkand. I felt like I was on a film set from Aladdin in these sandstone neighbourhoods. Once again the people were very friendly and inviting. This country was one of the highlights from my trip, we had a break from camping and stayed in some decent hotels for next to nothing. 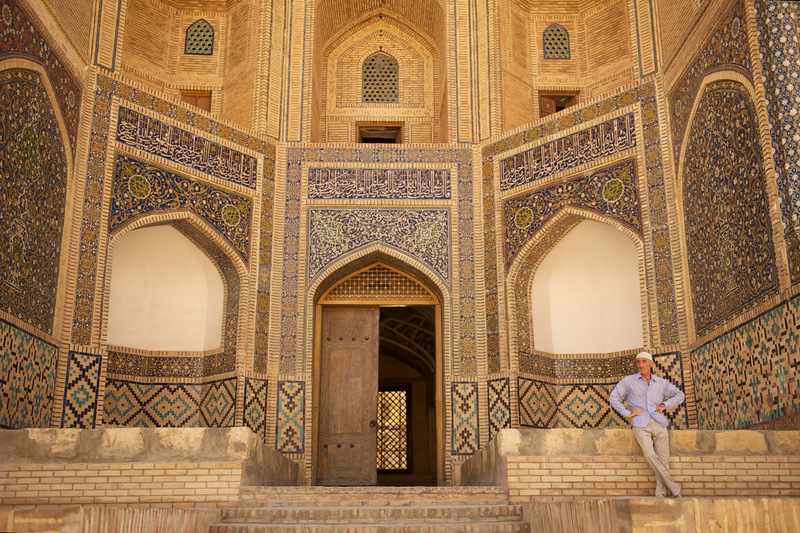 From Uzbekistan we were unfortunately forced to head East into Kyrgyzstan and miss Tajikistan due to civil war breaking out. A few teams tried to head that way regardless but were turned around. 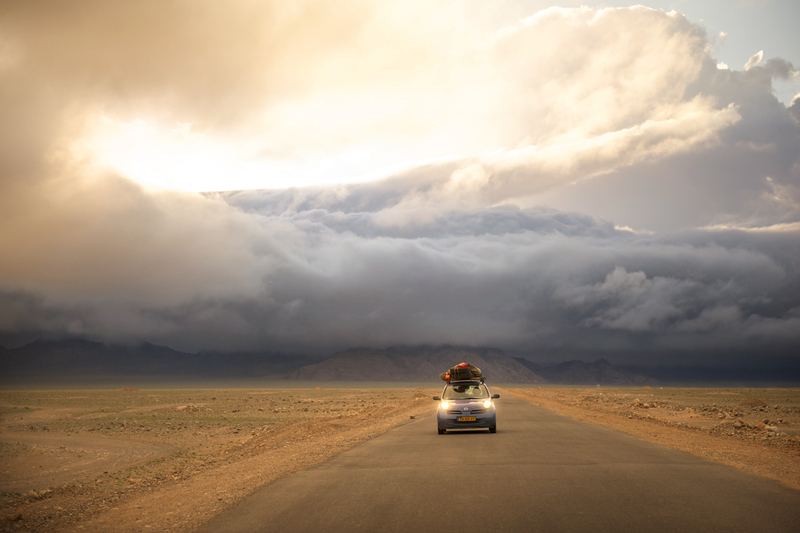 This meant missing the Pamir Highway which was a great disappointment but the scenery in Kyrgyzstan made up for it. Below is a shot from above a turquoise coloured lake that almost appeared as if it were glowing. 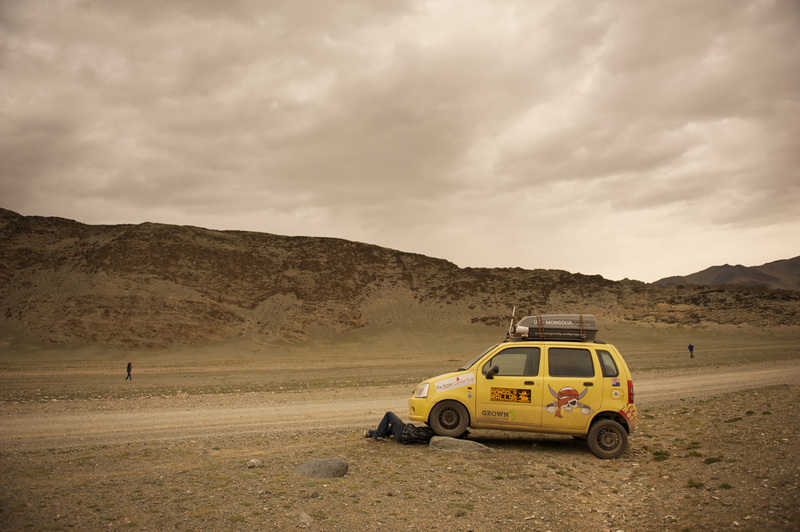 The Suzuki did really well through the mountain passes; we were fortunate that the roads were in very good condition too. Our campsite with our Italian friends Samuel and Andreas from ‘We Go Of Nothing’. Several times they cooked us pasta in some delicious home made Italian sauce. We were up on a plataeu at around 2500 metres here and it was the first night that things got really cold. 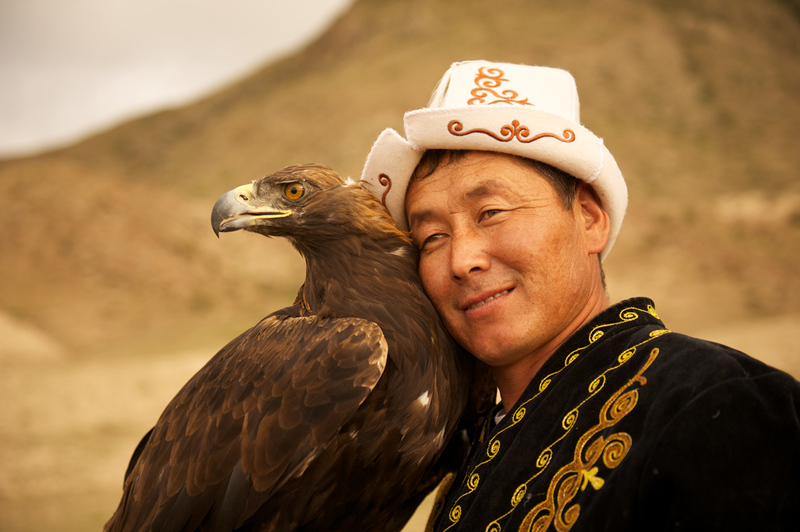 The next day we were very fortunate to see a traditional Eagle Hunter (that is hunting with Eagles not of Eagles). 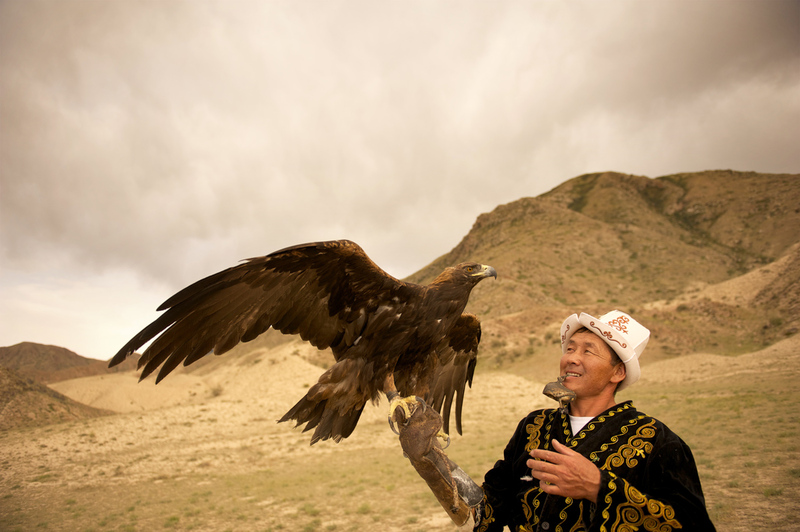 It is mostly practised as a sport now but is still used to hunt for food in places. 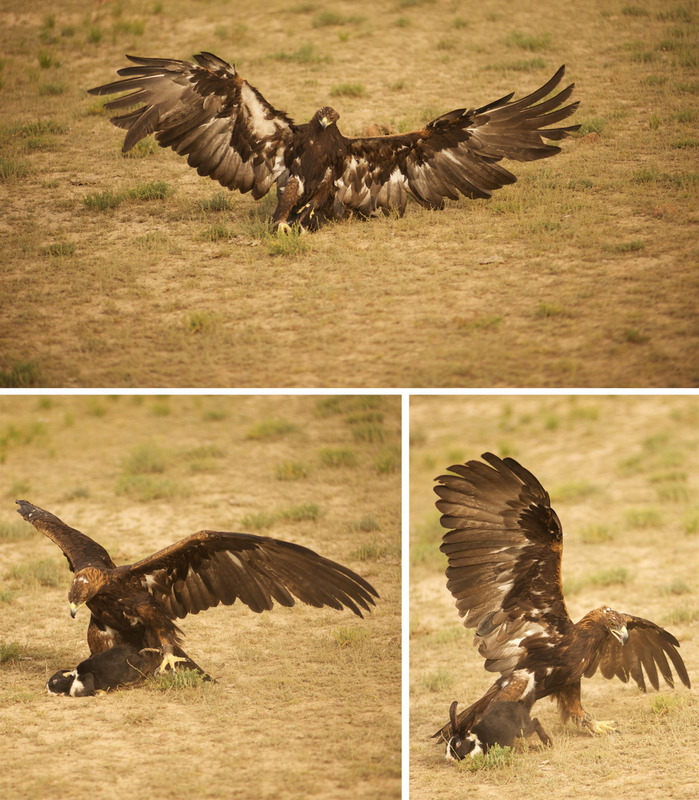 Driving back from watching the Eagle Hunting we got a taste of what Mongolia would have in store. We were all hanging out the windows trying to catch the rugged scenery against the sunset backdrop. 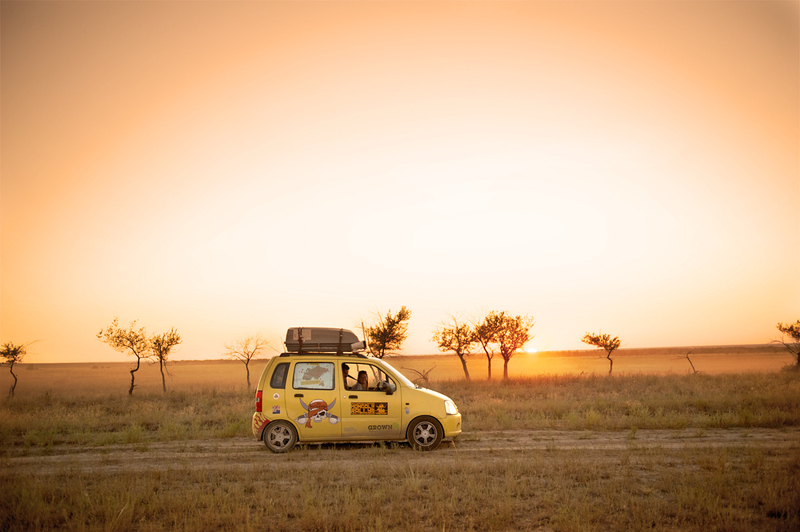 Heading into Kazakhstan we had our first problems with the Suzuki. We broke a wheel bearing causing the wheel to almost fall off. We stopped in a local garage and a mechanic spent several hours bodging a new bearing to use and then refused to accept any payment! We then set off again and travelling at 60 mph hit some pot holes pretty hard causing two wheels to buckle (one enough to let all the air out of the tyre) and a suspension coil to snap. 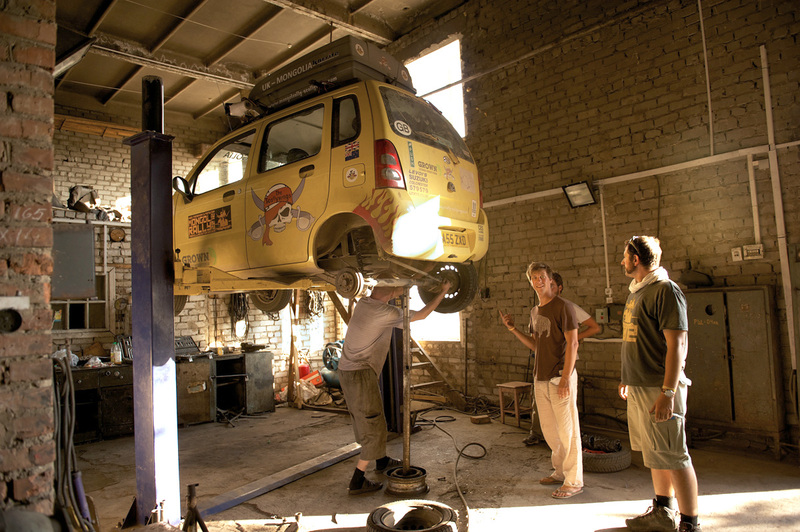 We managed to borrow some wheels to get to Semey where we went to another mechanic’s. He raised and fixed our suspension, we hammered out the wheels and replaced the rear tyres with some harder van tyres we had. 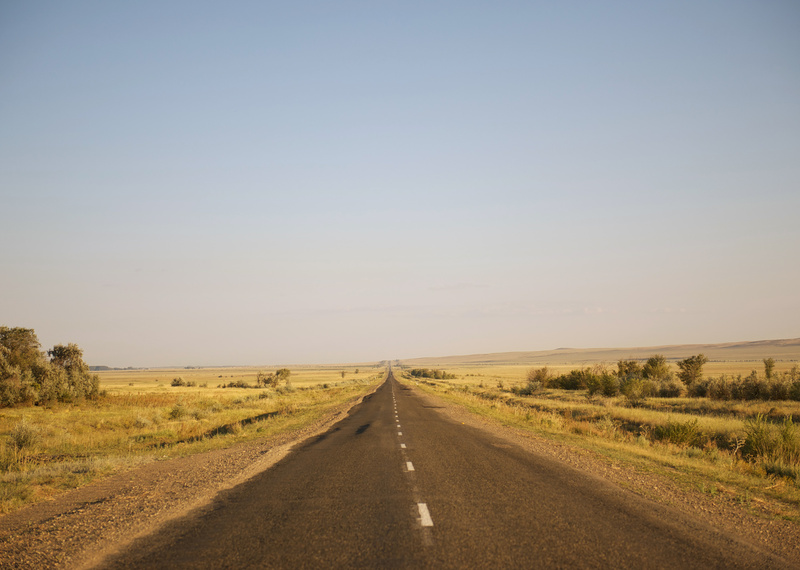 One of the many very long, straight, but unfortunately not so flat roads in Kazakhstan. Click on the photo to enlarge it and you can get a good look into the distance. 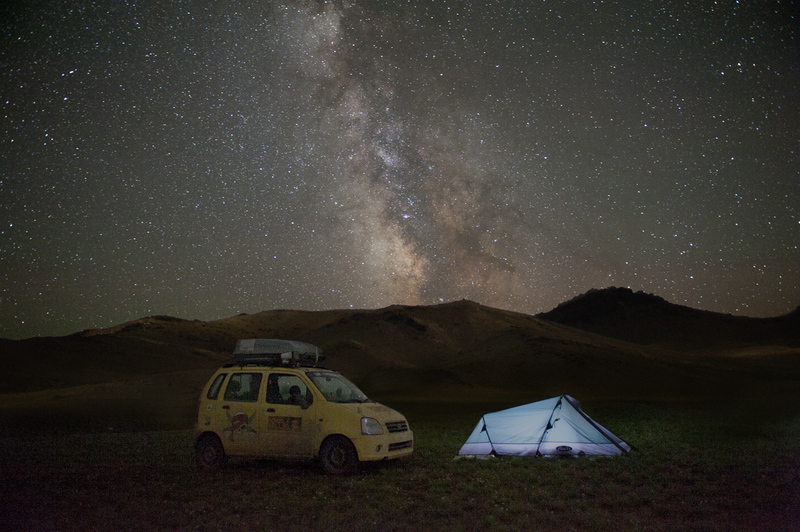 One of my favourite campsites in Kazakstan. I could almost imagine that we were on an African Plain. 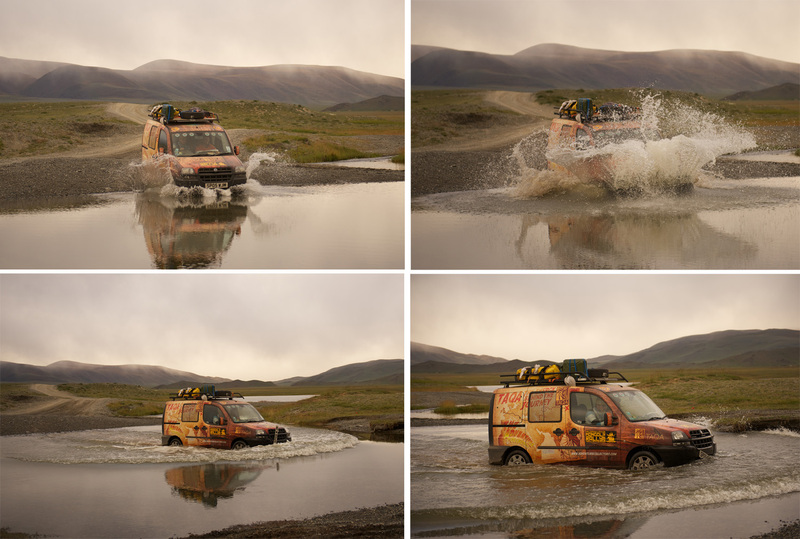 ‘The Adventure Collectors’ first river crossing (more like a pond crossing) didn’t go so well, they stormed it a little fast and flooded the engine. We towed them out and after some work from mechanics on another team we managed to get them going. 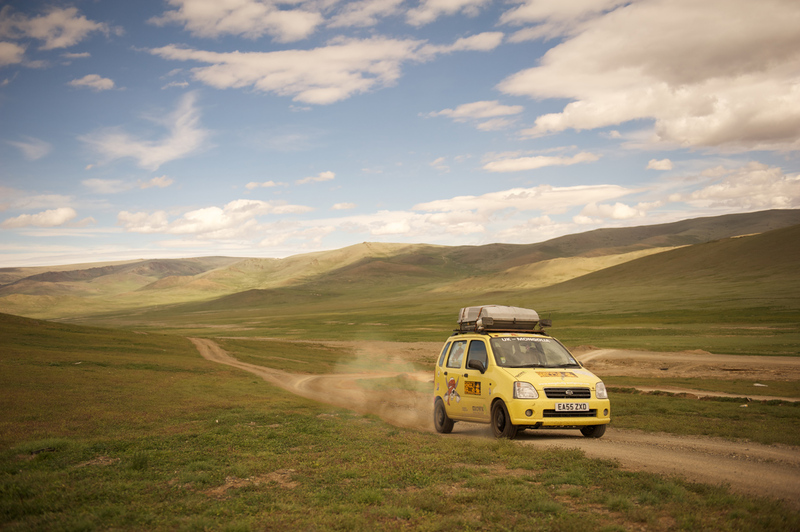 The first 300 kilometre stretch in Mongolia was stunning. We drove through rivers, wound through mountains and saw all types of animals. After this stretch the scenery was far from boring but it flattened out and we spent most days driving through plains. We managed to bend our sump guard by hitting a large rock which caused it to push into our exhaust and make some disconcerting sounds. James got under with some mole grips and managed to bend it back into place. 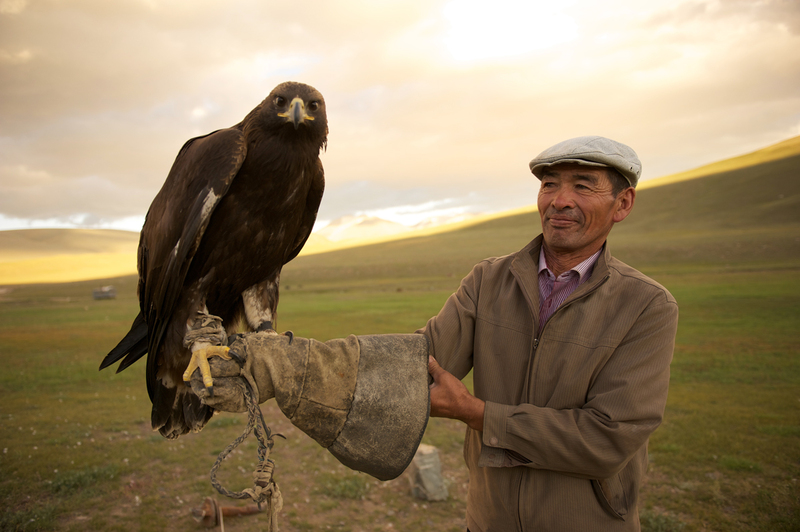 We came across another large eagle on our first day through Mongolia. 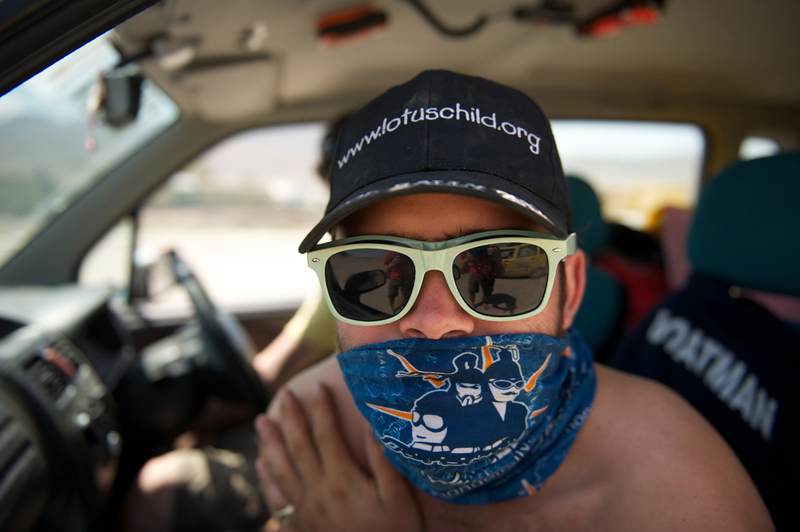 This is one of the guys from a team we were convoying with. 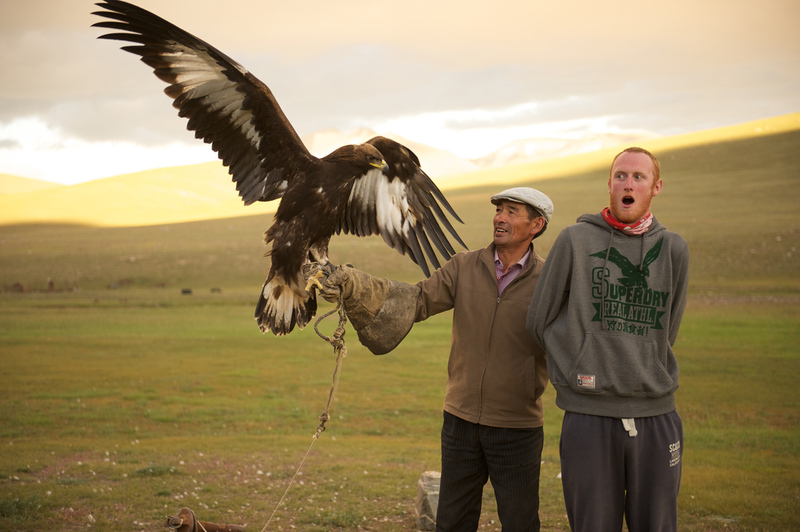 Let’s just say he was a little afraid of large birds. 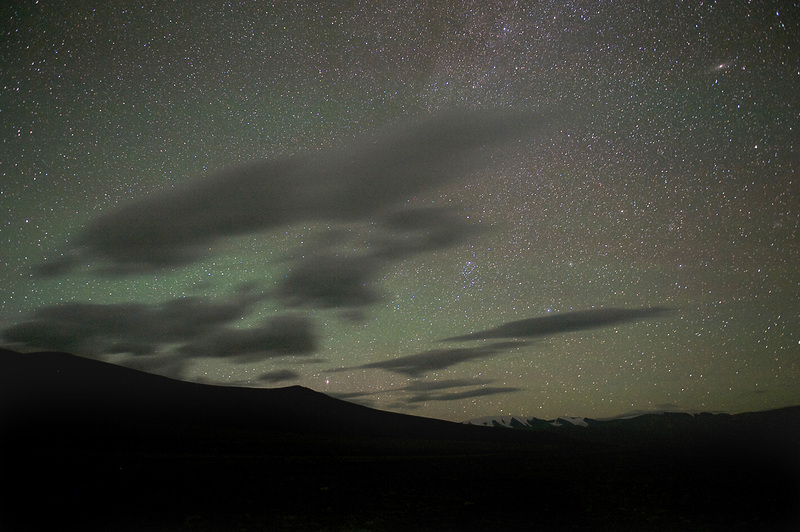 The first night in Mongolia we had some incredibly clear night skies. We were very lucky that there was a new moon so the stars were even more visible. I am not sure where the green glow came from but it certainly makes for a good photo. You could see the whole of the milky way stretching across above you. On our second day we came across these guys. 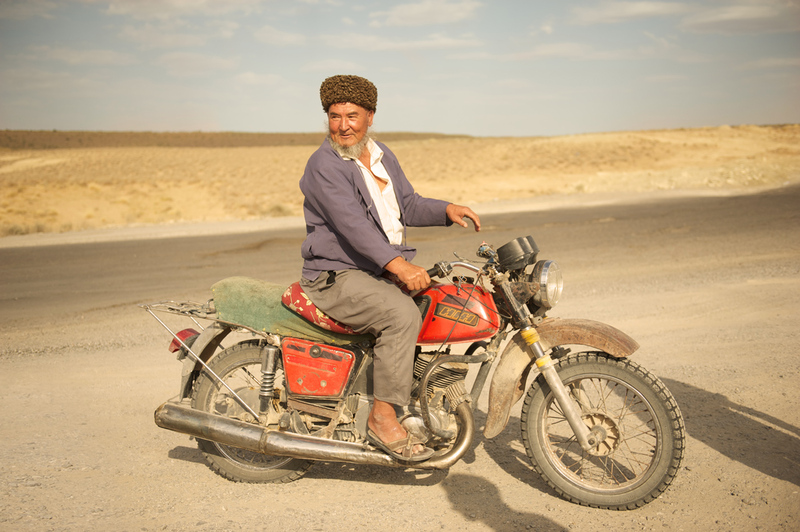 They had a nasty crash in Russia but with a smashed front end and a shattered windscreen (which let in dust and rain) they had still made it into Mongolia. They had driven too fast and then blown all but 2 of their tyres. They donated their last two to their friends’ car so they could get some from the next town (which was two days away). When we bumped into them they had been waiting 24 hours but were still in good spirits, getting drunk on fermented horse milk! 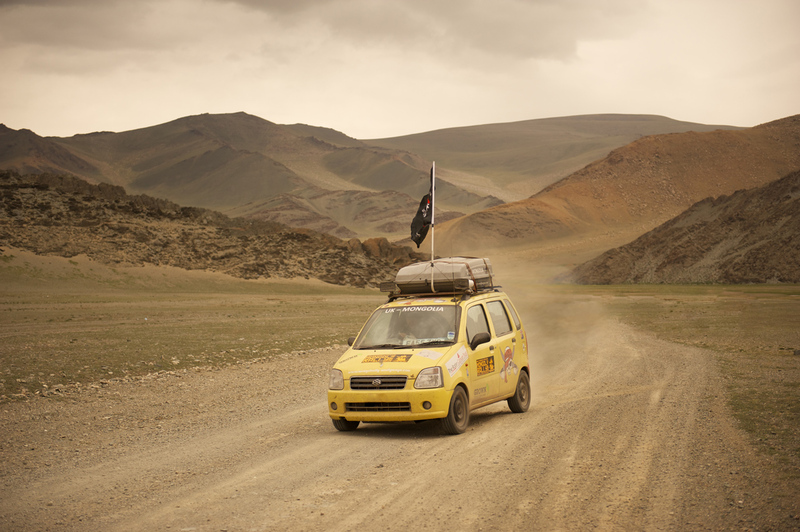 We generally did pretty well with navigating, although we did stop to ask the occasional local where we were and make sure we weren’t in China (as has happened to other ralliers)! Mongolia are in the process of building a highway from West to East (although from what I have heard they have been going 10 years and not got that far). It was odd to occasionally come across a 40 kilometre stretch of perfect tarmac. 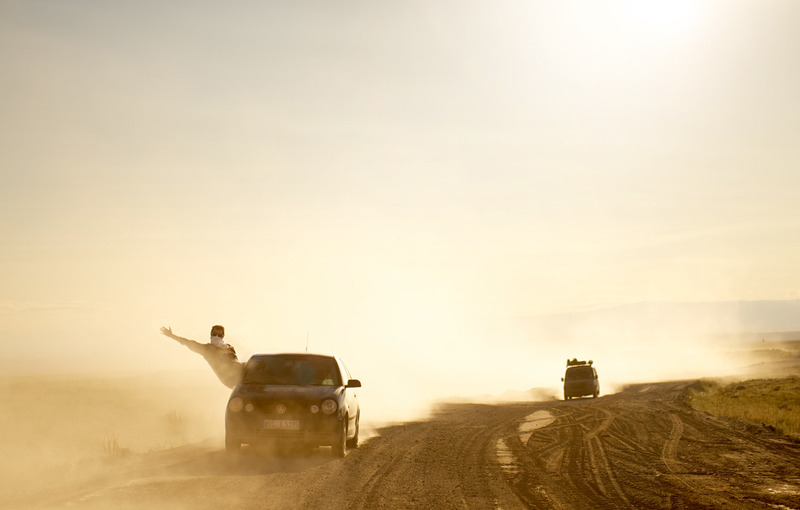 Generally, however, the roads are made from dozens of dirt tracks which constantly split and wind around and it is a challenge trying to find the smoothest one. Every now and then, there are no tracks at all and you have to just follow a compass heading. 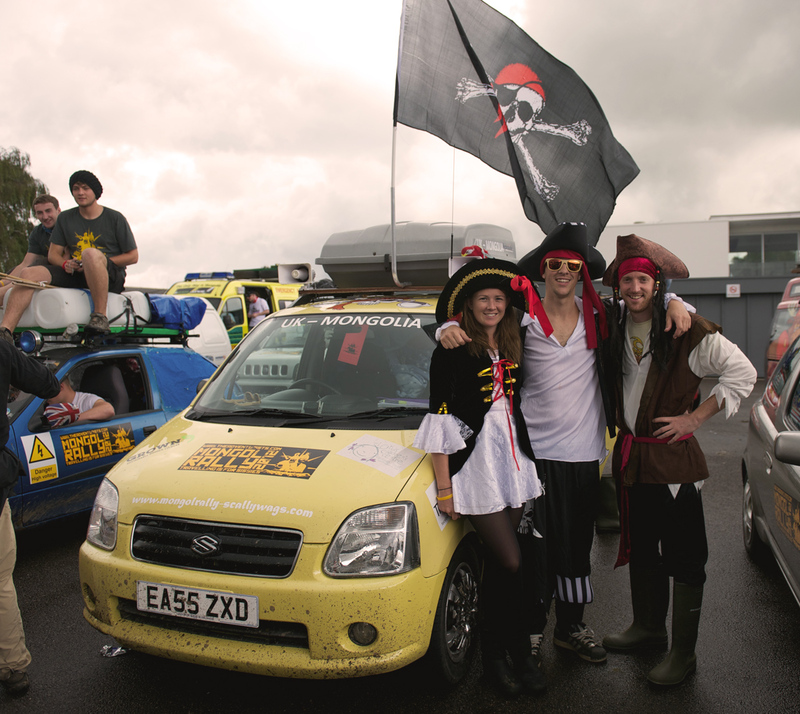 We couldn’t resist getting dressed up and taking advantage of those pirate costumes (and James’ stamina). Some of the skies were incredible. This one below was formed by clouds rolling off the mountains behind (as we were driving down one of the elusive strips of tarmac). Right after there was a sandstorm over to the right of us which we luckily managed to miss. 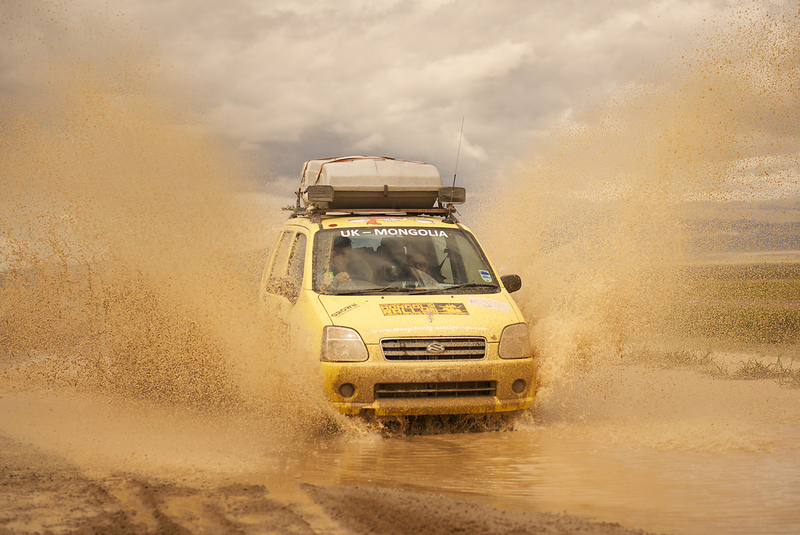 On the third day we had our first proper river crossing. We had to get towed by a tractor. We were first off, so we taped up our air intake and exhaust and set off. We got through with no incidents which is lucky considering how high the water was! 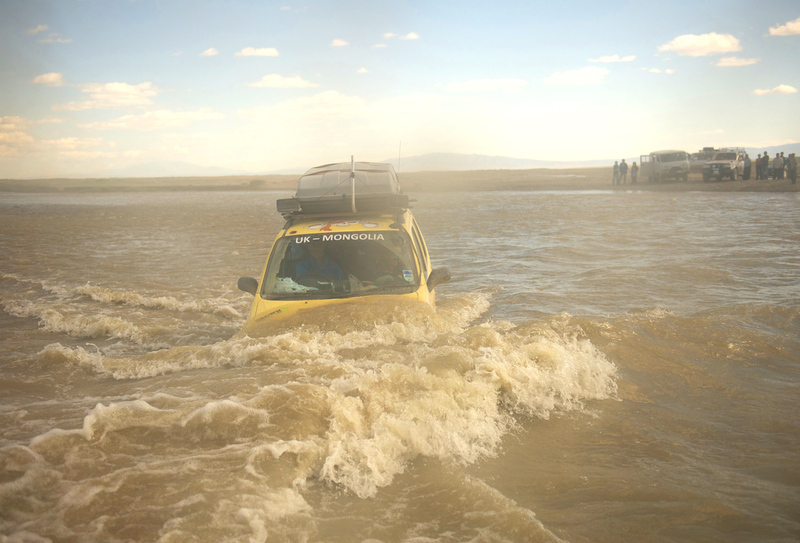 Several teams got stuck and completed flooded their cars with water. 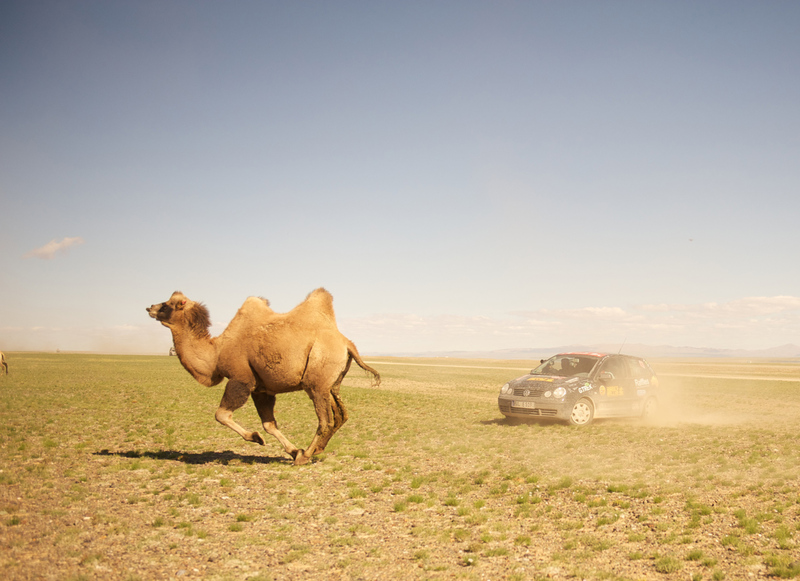 Trying to get a photo of our cars with a camel was easier said than done. We tried creeping up slowly but they always hot footed it away from us. 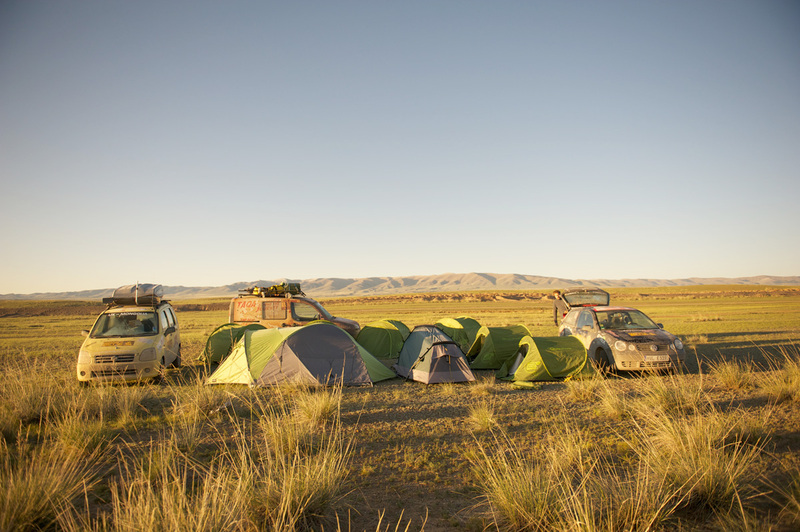 One of our last camp sites in Mongolia. It really got cold during the nights, often into the minuses. I had a really bad cheap sleeping bag and would often wake up very cold with ice on my tent. On the penultimate day we had some interesting bridges like this one. Theres no way we would have crossed it (considering the planks moved just by walking on them) if we hadn’t seen a local do it in a van first. I wanted to get the stereotypical ‘splash’ shot, so I asked James to put his foot down. James being James, didn’t disappoint (although I did get covered in muddy water). 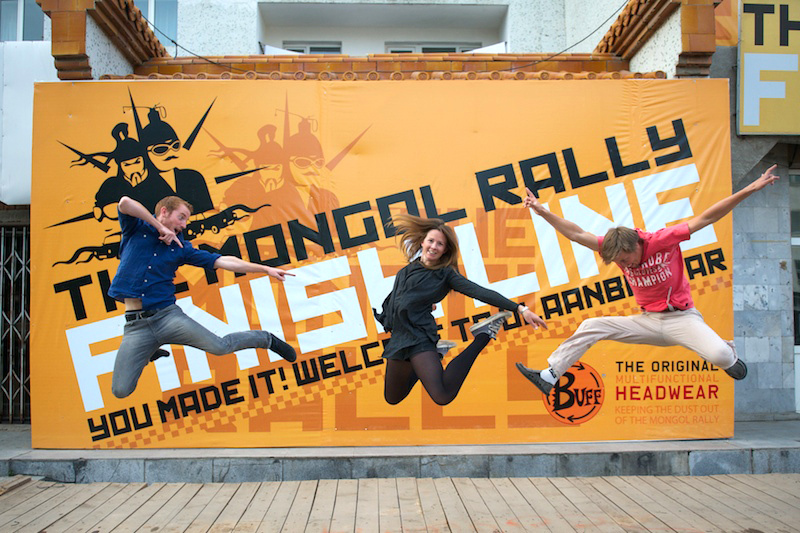 After six days in Mongolia camping every night and nine days without a shower, it was more than a little relief to reach the finish line. I was so impressed with our Suzuki for the beating she had taken and we had barely had any problems. All in all we made 9058 miles in 43 days. It really was the trip of a life time (until the next one at least) and I will never forget the experiences we had and the people we met. We raised over £1300 to charity and our car and equipment is currently being sold to hopefully make a considerable amount more. I want to say a huge thank you to all who have donated money to charity for us and to our sponsor GROWN sustainable eyewear.